On this date in 1831, Mariana Pineda died for her flag. The widowed 27-year-old (English Wikipedia page | the much more detailed Spanish) had become a devotee of the liberal Zeitgeist that contended in post-Napoleonic Europe with absolutism. Spain had had the briefest of flings with liberal government in 1812, only to have Ferdinand reverse Spain from one of the most progressive governments in Europe to one of its most backward. The man even reintroduced the Spanish Inquisition. By the 1830’s, tensions between constitutional liberals and unreconstructed royalists had Spain on the point of civil war, which would in fact erupt upon Ferdinand’s death two years hence. Mariana Pineda swam with liberal circles, even helping a death-sentenced cousin escape prison. In 1831, the authorities found a flag in her home embroidered with the “Equality, Freedom and Law” slogan. 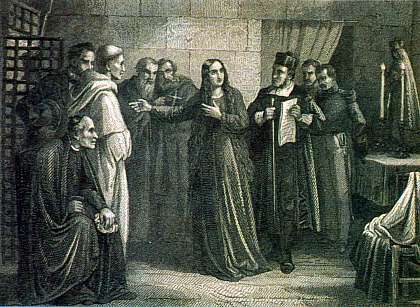 Pineda refused to name accomplices, and Ferdinand threw the book at her. Pineda remained adamant. Her prediction wasn’t so far off. 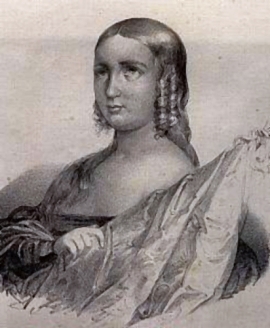 Pineda’s posthumous repute as heroine has migrated from the particular cause of her day to the general pantheon of Spain. These days, a Granada public holiday (festivities held in the square named in Pineda’s honor) commemorates her sacrifice. Her name is also a byword for the struggle of women to win full political participation (there’s a Centro Europeo de Las Mujeres “Mariana de Pineda”). And martyred playwright Federico García Lorca turned her story into a theatrical classic — his first successful play.